One of the best tools for evaluating plans for a new business, product, or marketing campaign is to convene a panel of experts and have them take a hard look at what you hope to accomplish. Case in point: Launching a new product or service without doing a thorough review of the plans or concept… That’s what Ford did with the Edsel, and it not only became a losing proposition, but a legendary joke that the company has never fully lived down. Even commissioning a huge body of research may not be enough. Remember New Coke? Is there something more you can do? Something that will be more important than blowing your budget caps and hiring expensive help? Maybe you just need to expand your thinking. With ThoughtOffice’s Expert Expander module you can broaden the scope of your thinking even when you’re the only one in the room. The questions the program asks you will quickly take your thinking far outside the box. It’s like having a group of top business innovators on the payroll – without having to pay them for their time (or their per diem). In fact, you will have access to the expertise and experience of over 200 of the best contemporary business minds – because they wrote the questions we included in Expert Expander so that you could benefit whenever you need them. You won’t have to hire an expensive consulting group to act as your hired gun Change Agent either. You will already have that capability on board and at the ready to go, in the form of a persistent software application. The Expert Expander Module will put your ideas to the test and let you expand your thinking more quickly and efficiently than you ever imagined possible, especially at such a low cost. 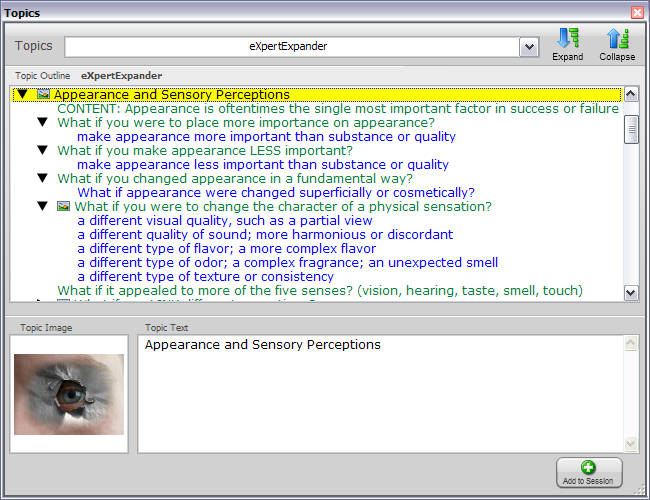 ThoughtOffice Expert Expander comes pre-loaded with over 2,000 queries, prompts, comments, and ideas. Harnessing the power of the integrated IdeaBrowser, it extends the reach of EVERY module in our set. You can plumb the depths of any situation your company faces, and develop a solid, enhanced plan for dealing with it, right from your own keyboard. The implementation of the results will still be up to you, but the expansion of your thinking will make it far more certain that your solution will hold up under fire. It’ll be well worth putting in an hour or two with the Expert Expander Module. You’ll get a great return on the investment of your time. Some of our most successful customers call ThoughtOffice Expert Expander the most valuable module we offer. This module will expose any weaknesses in your plans and strengthen all of the decisions you make.